a good idea of what I was working on. is very close to what I did while a graduate student. • Materials by computational design. • Bayesian methods for uncertainty quantification. • Designing new materials in silico with optimal properties. faster and more precise engineering of materials. I do most of my work on the Olympus supercomputer at Pacific Northwest National Laboratory in Richland Washington. The lab is governed by the United States Department of Energy. 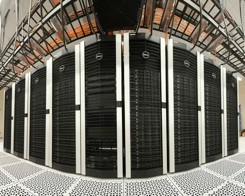 I also have access to, and use, the supercomputers (in particular Hopper) at the National Energy Research Scientific Computing Center (NERSC), which is a division of the Lawrence Berkeley National Laboratory in Berkeley, California. And for my collaboration work with the Predictive Science lab at Purdue University I use the Conte supercomputer as well as the Rice supercomputer. This all means that I spend all my research time navigating and heavily using a linux environment writing everything from little shell scripts (in BASH, CSH, or whatever is needed) to full Python and C++ programs. I have experience in JAVA, R, Visual Basic 6.0, Python, VASP, MatLab, Maple, and LAMMPS as well. Most of my work in the first year was with BASH, C++, and VASP (performing robust auto-correcting energy computations of binary alloys), MatLab, and LAMMPS (setting up, minimizing, and thermalizing nano structures). In my later years I switched mainly to Python investigating various useful modules. Working and developing code in Python simply seems faster. For me it seems like a great mix between BASH and C++ giving me most of both worlds. I started writing scripts in Python but have gone over to writing entire packages in my research. To keep track of my work I use bitbucket. This is a version control system that allows me to keep track of my files and of how the program develops. I can share the program with others and we can develop together. If you are new to Python I would recommend reading the books by H. P. Langtangen and also use the “Python Cookbook” by Beazley and Jones as a reference. This issue of optimizing something, under a given set of constraints, is naturally at the very heart of the engineering discipline. 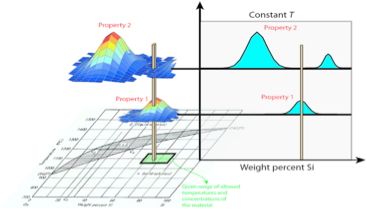 Very simple example: Given that you want to maximize both property 1 and 2 what is the best weight percent Si to use given the operating environment (a certain temperature; this is represented by the green area on the phase diagram to the left). It is relatively easy to solve the optimization problem in a “forward” sense: Give me the structure and I can tell you the value of its properties. The inverse problem: Give me the properties, and I will tell you the best structure, is, however, not easy (in fact, it is ill-posed) but generally far more interesting. I really see a big future in designing “virtual laboratories”, where we do not even have to perform any real experiments, but can get the answer from simulations. This will save a lot of money and time, but also be easier to distribute to the general public. Just like Edison invented the modern light bulb by trial and error of using real materials that he had access to, it is exciting to think that we can do the same on the computer, but with access to many many more materials. Furthermore, I am seeking to pioneer the serious implementation of information theory in the materials science field. My recent work makes progress towards this goal. Surely, the progress, and success, of any society is, by large, based on its understanding of material manipulations. This makes my work really exciting and rewarding in itself. In addition, the tools I develop and optimize are applicable beyond just materials design as well. Yes, it is a very exciting research area, with many opportunities. Note: This page might not display properly in the latest Internet Explorer. It does, however, work in Safari and Firefox browsers.